Having made pieced quilts for many years, Cherry is now concentrating on wholecloth quilts. She puts colour on to cotton cloth using mainly thickened procion dye. Soya wax and discharge paste are sometimes applied. Cherry uses silk and thermofax screens, credit cards and paint brushes and she quilts by both hand and machine. 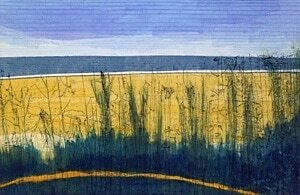 Cherry's current work is inspired by the landscape of North Norfolk and other areas. She takes photographs and uses these as the inspiration for her quilts. Festival of Quilts 2010. Winner of The Quilters' Guild Challenge. Festival of Quilts 2012. Winner of The Quilters' Guild Challenge. Festival of Quilts 2014. Quilt juried into The European Art Quilts VII exhibition. Festival of Quilts 2014. Quilt juried into The Fine Art Quilt Masters exhibition. Ste Marie aux Mines, France. Quilt juried into The SAQA Wide Horizons IV exhibition.